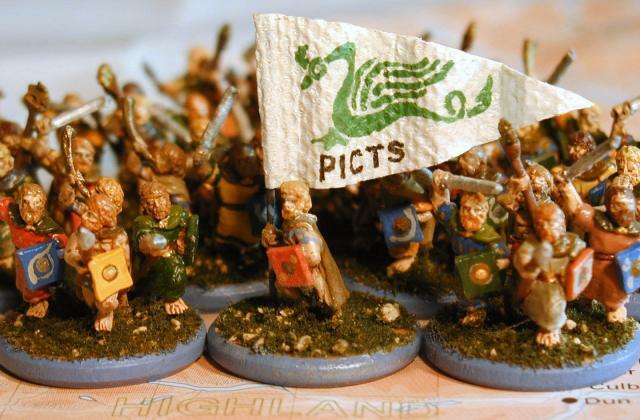 The Picts and Brigantes are two of the oldest pre-Roman inhabitants of Great Britain. Both inhabited and battled the Romans and each other for the lands of Northern England and Scotland. 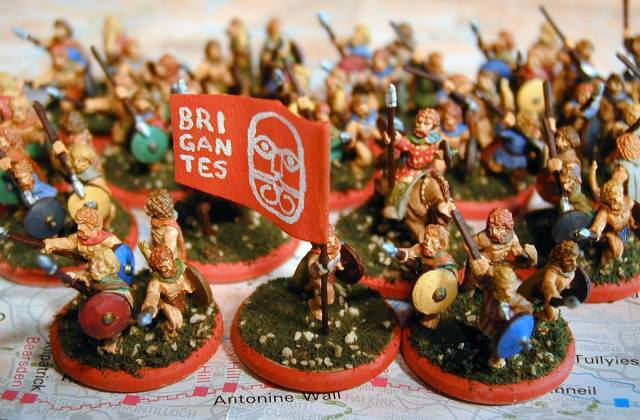 According to Britain Express the Brigantes were the most powerful Celtic tribe prior to the Roman invasion of 43 AD. 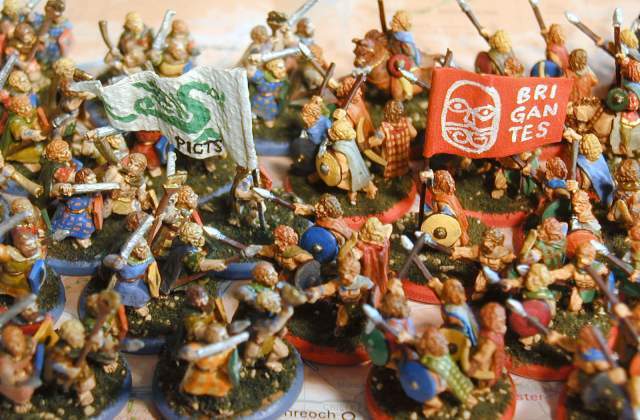 Like the Picts and other Celtic tribes, the Brigantes were often matriarchical. They were ruled by queen Cartimandua when the Romans came. Initially they were friendly to the Romans, sometimes betraying other Celtic leaders to the invaders. Eventually, Cartimandua deserted her husband Ventius and fled Brigante territory. Ventius rebelled against the Romans but was defeated by Petillius Cerialis in 73 AD. They lived as a Roman protectorate until 138 AD when Antonius, for whom the Antonine Wall is named, pushed north from Hadrian's wall. The Brigantes fought, and eventually the Romans fell back to the more defensible Hadrian's wall. 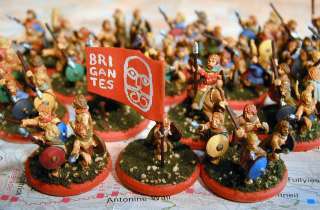 Examples of Brigante art and culture are available at the archaeology society Brigantes Nation. Especially notice the wonderful gold and bronze pieces of the Celtic Iron Age. More detailed information about early British tribes is located at Roman-Britain.org. According to the Osprey Publishing reference Pictish Warrior AD 297-841 , the Picts were inhabitants of northern Britain from AD 297 to 858. The word Pict is derived from the Latin pictus which means "painted", obviously for their blue woad flower tatooing, but the Romans used the word Pict as a tribe name such as Belgae or Scotti . When Agricola invaded Scotland in AD 84, his aim was force the predecessor of the Picts, the Caledonians, to submit. He did have several victories and the Orkney Islands submitted, but after he withdrew, the Caledonians continued fighting the Romans. In 208 AD, Emperor Septimus Severus (for whom the longest river in Britain the Severn is named) came to Britain and continued the war. The Caledonians were nearly wiped out, and as a result the Pict culture grew. During the fourth and fifth centuries, many Scottish people came to Scotland from Ireland. Sometimes the Scots allied with the Picts and other times they went to war. In 537 and 538, the Scottish kings Comgall and Gabran mac Fergus were killed by the Picts. In 683, the Picts laid waste the Scottish capital of Dunnadd. In the 9th century, the Picts were at the height of their culture, when Vikings starting raiding Scotland. In 839, the Pictish king was killed in a battle with the Vikings. The Scots attacked and proclaimed Kenneth MacAlpine king of the Picts and Scots. Eventually the Pict civilization faded into history. Although the Pict people are gone, or perhaps blended into the modern Scots, the Pict culture still exists today in Scotland. There are many sites of Pictish round forts or brochs. There are many examples of Pictish art carved in rocks or in swords and helmets, bronze pins, torcs, and other jewelery. And the imagery of a blue-painted Mel Gibson as William Wallace in Braveheart lives on, although this is more a Pictish rather than a Scottish look. In fact the look of Mel Gibson's entire army is much more 9th century than 13th century, the actual time of William Wallace. My Pict figures are Old Glory 15 mm Pict Command (PC1), and Pict Warriors (PC2). These figures have a lot of small squarish shields just like the ancient Picts. They are painted with Vallejo acrylics many having plaid tunics and ancient symbol shields. The flag bearer, who is used to mark the Pict population in the game, has a flag made of tissue paper hardened with cyano-acrylic glue. The peacock beast symbol is modelled after one of the many beast carvings found on Pictish symbol stones. Last modified: Thursday, 09-Jun-2011 12:38:58 MST.